Many people are deeply concerned about the condition of their hair. 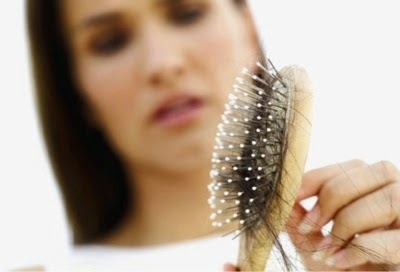 Some will actually do almost anything to prevent further hair loss or to re-grow hair. I speak from a personal point of view as I've been suffering from excessive hairfall from the damages caused by constantly styling and coloring my hair. This is quite alarming for me. Sure, there are a variety of pharmaceutical products that claim to promote hair growth and prevent thinning hair, but either they do not really work at all or they're pretty much expensive. Like everyone else, I don't want to see a receding hairline in the future. 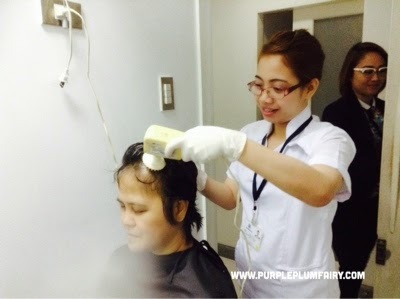 So when a friend recommended me to try Haircial Treatment at Dr. Vinzon Pineda's Dermclinic, I've tried it right away. If you're experiencing the same thing, it's time to get some help from the experts. Do something about it while you still can. Cliche as it is but true: "Early prevention is a whole lot better than cure." Dermclinic's Haircial treatment helps treat the scalp and hair and has been proven to be effective in the prevention of both baldness and dandruff. It even helps restore hair pigment to its original color. Like I've said earlier, I've tried it myself and I've been thankful for the experience. Haircial treatment starts with the application of a secret yellow protein concoction which smells really delicious--it smells sweet like maple syrup pancake. But of course, it's not something edible. It's then followed by a relaxing scalp massage. The massage therapy is given to relieve muscle tension in your scalp and to control the formation of dandruff. Afterwards, you're given a hair steam for about ten minutes. And then, your hair will be rinse with water. It will also be treated with a medicated shampoo and conditioner. And you'll be put under photo light dynamic treatment followed by an application of Minoxidil to promote hair growth. This process stimulates blood circulation in the scalp and eliminates toxins through sweating. 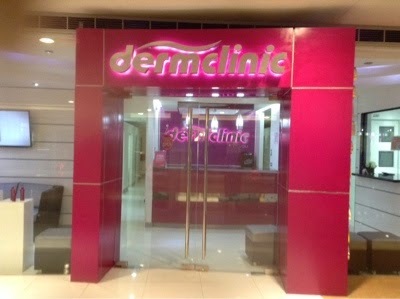 Haircial is available at all Dermclinic branches. This hair treatment caters to 18-year-olds and above. The more you do this treatment, the better and earlier you'll be seeing the results. 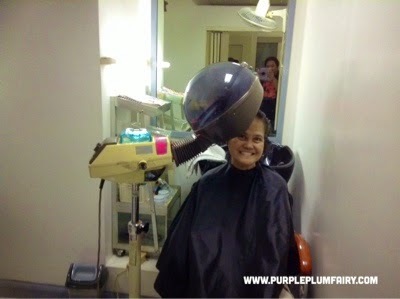 A single treatment costs Php495, but you'll totally get your money's worth since you'll notice improvements right away. My hairloss stopped right after my first treatment and my hair got thicker and stronger. It even looks healthier than before. Now I can afford to style my hair however I want without having to worry about dryness, dandruff or hairfall. Dermclinic's haircial treatment has got it under control! Want to try the Haircial treatment yourself? Purple Plum Fairy had been chosen as one of the digital ambassador of Dermclinic so it has partnered with us and is sponsoring this giveaway so my readers and blog followers have that opportunity to try it out too! Join my latest giveaway from Dermclinic! Please follow the mechanics on the Rafflecopter below. The giveaway is open to Philippine residents only. Winners will be announced via Purple Plum Fairy's Facebook Page and will be receiving an email with details on how they could claim their prizes. Prizes are transferrable but cannot be converted to cash. Contest runs from March 12 to March 30. Winners will be announced on March 31. Good luck guys! I want a Haircial Treatment because I want to give life again in my hair after rebond I had last year. It become brittle, dull, frizzle and thin. Ineed to rescue and give a break. I have a bad case of dandruff. Tried a lot of shampoos already but none worked for me. Currently, I order Selsun Blue in KSA to help me manage but it's still there. Reading it as an effective way to treat and control dandruff just got my hopes high. I want my hair to have a haircial treatment because it is becoming dull and dry! I am suffering from severe hair fall, I even switch to non- sulfate shampoo and bob- cut my hair so I won't be combing too much as I don't want to see hair on my comb. I want a Haircial treatment because I want to re-grow my hair and stop from falling. I want to win this because I want healthy hair and scalp.Been suffering from dandruff since forever and I had a scary bout of hairfall last year. I would like to see if doing this would have an impact. I want a Haircial Treatment because I have a dry and dull hair. And sometimes have dandruff. I want a Haircial Treatment because as we age our hair needs special treatment. Our hair is our crowning glory. So it is important that we must treat it to have a healthy hair.